Horace Cyril Casley Heard was born in 1895 at Crediton, Devon, the eldest child of insurance agent Thomas Heard (1870-1938) and Bessie née Casley (1865-1913). Thomas and Bessie's children were; Horace, Olive Dorothy Vinnicombe (1897-1973), Douglas Casley (1899-1951), Albert Edward (1901-1962) and Norman Cecil (1904-1968). Although Horace was born in Crediton, within a couple of years of his birth the family had moved to Langport, Somerset, where they were recorded living in Bow Street in the 1901 census and Thomas was listed as an insurance agent. By 1911 16-year old Horace was living in Bristol with his uncle Albert Casley and his family. Horace was working as a clerk in a biplane works. Shortly afterwards the Heard family moved to 17 Brunswick Street and Horace rejoined his parents. At this time he was working in the office of Messrs. Tompsetts of West Hendford. Horace then changed jobs, moving to Southampton, Hampshire and it was here, just after the outbreak of war that he enlisted in the Scots Greys with Service Number 23978. He was quickly transferred to a Reserve Cavalry Regiment with a new Service Number 9405, but was finally transferred to the 7th Battalion (Ross-shire Buffs, the Duke of Albany's) Seaforth Highlanders. His new Service Number in this regiment was S/10394. The 7th (Service) Battalion had been formed at Fort George in August 1914 as part of K1 and came under command of 26th Brigade in 9th (Scottish) Division. The battalion moved to Aldershot and in January 1915 went into billets in Alton. It moved on to Bordon in March 1915 and landed at Boulogne in mid May 1915. Horace joined his battalion at the front on 12 August 1915. Within a few weeks the 7th Battalion, including Horace, was involved in the Battle Of Loos. The Battle of Loos (25 September – 15 October 1915) was part of the wider Third Battle of Artois, itself part of a wider Allied attack on the German lines in the autumn of 1915. 25 September saw the start of the Second Battle of Champagne, while in Artois the French attacked Vimy Ridge. The British attack was to be launched by six divisions from Douglas Haig’s First Army and the attack was preceded by a four day bombardment that would see the first use of poisoned gas by the British. The Chlorine gas would be a great disappointment. It was released at 5.50 am, giving it forty minutes to do its work before the infantry attacked at 6.30. However, much of the gas either lingered in No Man's Land or drifted back over the British lines. Despite this setback, the first British assault was a success. By the end of 25 September the British had advanced to within a thousand yards of the German second line to the north of Loos. The reserve divisions were needed to attack this intact second line of defences. However, poor communications and poor planning meant that the reserves didn’t reach the original British lines until the end of 25 September. The next afternoon the 21st and 24th Divisions launched an attack in ten columns across the open ground in front of the German second line. Largely unaffected by the four day bombardment, the barbed wire in front of this second line was intact. The British advanced to the wire, taking horrific casualties all the time, and were then forced to retreat. The battle had been so one-sided that many Germans stopped firing during the British retreat. The battle continued for another three weeks. When the fighting finally died down, the British front line stood close to the line reached at the end of the first day, although the Germans had recaptured the Hohenzollern Redoubt. British losses at Loos were close to 50,000, with 16,000 dead and 25,000 wounded. Estimates of German casualty figures vary, but the most common figure is for a total of 25,000 losses, half the British figure. However, on the first day of the battle, 25 September 1915, Horace was severely wounded in both legs. He was taken to No 13 Stationary General Hospital, Boulogne, where one of his legs was amputated. 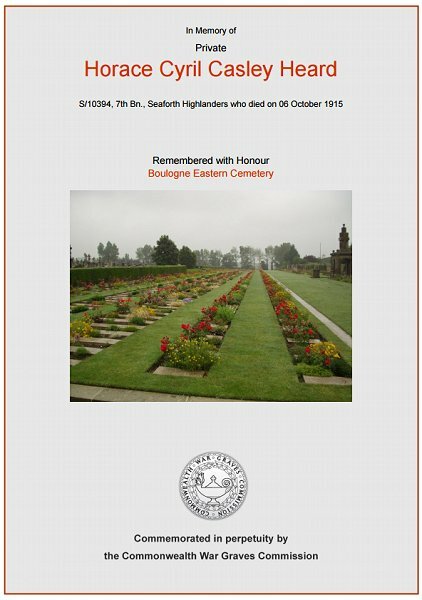 Sadly he died from his wounds on 6 October 1915. He was 20 years old. In its edition of 8 October 1915 the Western Gazette reported "Notification has been received by his father residing at 17 Brunswick Street, that Private HC Heard, is in one of the base hospitals in France, suffering from severe wounds to the left leg and right thigh sustained in action on September 25th. Private Heard was at one time employed in the office of Messrs. Tompsetts of West Hendford, from whence he moved to another situation at Southampton. He enlisted in the Scots Greys soon after the commencement of the war, but was later transferred to the Seaforth Highlanders, and was drafted to the Front with his Regiment about six weeks ago. The latest news received from the hospital intimates that the wounded “kiltie’s” condition is serious. It has been found necessary to amputate one of his legs, and it was feared that the other one would have to be taken off." Horace Heard was buried in Boulogne Eastern Cemetery, Pas de Calais, France, Grave VII.C.45 and his name is inscribed on the Yeovil War Memorial in the Borough. Other Yeovil men buried in Boulogne Eastern Cemetery include - Albert Bowden, Henry Hardy and William Warren. The Commonwealth War Graves Commission certificate in memory of Horace Heard.